Just like sales, referral gathering is a process that starts on the very first appointment. 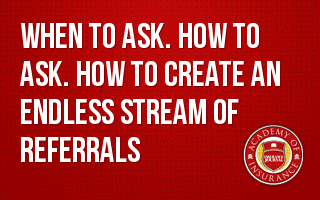 Learn how to build a process to generate a stream of new referrals. One sees and hears that producers should "only sell on referrals." It's good work if you can get it. And you can get it most of the time. Just like sales, referral gathering is a process that starts on the very first appointment. I bet most readers don't set up referrals on the first appointment. Why not?